Meanwhile in Norway... they seem to think incentives can get people into electric cars. The German Federal Government has set an ambitious goal of one million electric cars on German roads by 2020 as part of its "National Electromobility Development Plan" drawn up by the Federal Ministry of Economic Affairs and Energy (BMWi); the Federal Ministry of Transport, Building and Urban Affairs (BMVBS); the Federal Ministry for the Environment, Nature Conservation and Nuclear Safety (BMU); and the Federal Ministry for Education and Research (BMBF) in accordance with the Integrated Energy and Climate Programme (2007) of the German Government. The National Electromobility Development Plan includes more than EUR 500 million in incentives for the development of vehicles, energy storage devices and infrastructure. This figure has subsequently been increased by a further EUR 1 billion to the end of the current legislative period as part of the government's Electromobility program. Chancellor Angela Merkel's cabinet agreed Wednesday to set aside some 600 million euros ($675 million) of taxpayers' money to encourage people to buy electric cars - via an "environmental bonus." The costs of the scheme will be shared with the auto industry, which is also putting up 600 million euros. New car-buyers stand to get a 4,000-euro ($4,500) subsidy if they buy a purely electric car, and 3,000 euros if they opt for a hybrid car, which combines a battery and a small combustion engine. Not only that, electric cars will be exempt from motor vehicle taxes for 10 years. Economy Minister Sigmar Gabriel sold the scheme as vital to Germany's industrial future, arguing that electric cars will be key to maintaining Germany's leading position in the European auto industry. "The growing demand will trigger important and necessary investment along the entire supply chain of electromobility," Gabriel said. Sure, I’d like to see a tax on gasoline that reflects its greenhouse gases emissions. If we can’t or won’t do that, then maybe subsidies for electric vehicles can imperfectly address some of the same goals. If not that, how about free EV charging? Free parking? Higher speed limits for EVs? Discount air travel for EV owners? Complimentary massages? By the time you got to the last couple ideas, you probably said “well that’s ridiculous.” At least I hope so. But where do you draw the “ridiculous” line? ...We will never get to a pricing system that exactly reflects all the negative and positive externalities that our actions create. But that shouldn’t be used as an excuse to adopt indirect — and opaque — subsidies without a careful analysis of how well they address the basic market failure, and what other perverse incentives they create. A Twitter question following this post. "got any solutions? You're stating policy positions with no mention of underlying reasons." I intended this blog to be for articles of interest. It's changed because I tired of similar blogs not providing a context when linking, despite that requiring the introduction of editorializing - so now I try to strike a balance. This post brings up a number of hard questions that I think demonstrate the wickedness of the emissions problem - and the context for that is watch out for people who sell simple. 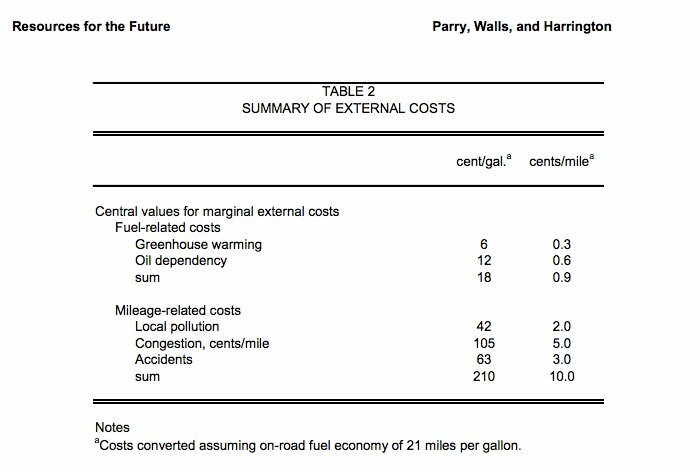 One of my favourite graphics for externalities is from a study I originally tracked down while reading a poor article (on a great blog) claiming it represented "external costs for a gallon of gasoline" of $2 per gallon. It shows 168 cents of external costs, 80% of the total, are due to accidents and congestion, and not fuel.